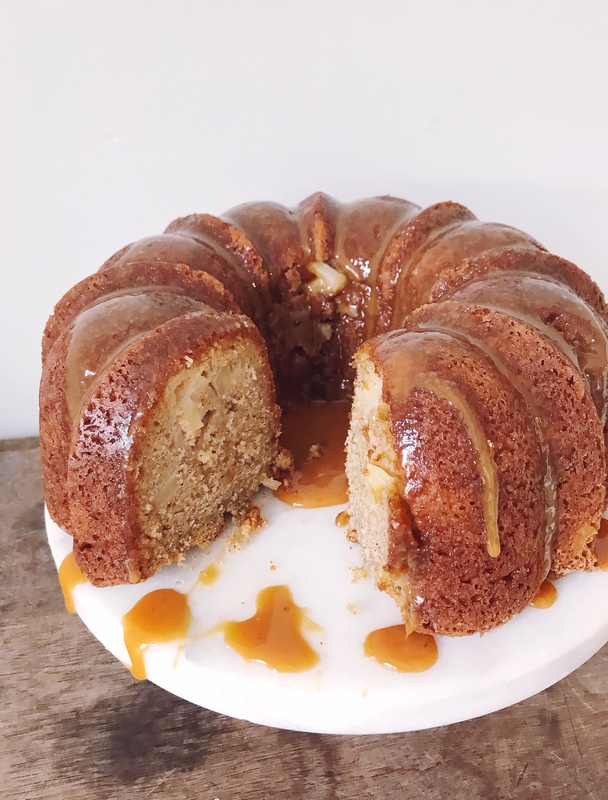 Spiced Pear Bundt Cake with Caramel Sauce. We’re in the thick of holiday season, and today we have one more holiday to celebrate: National Cake Day! My blogger buddy Melissa of Lulu the Baker alerted me to this delightful (definitely made-up) holiday, and we decided to celebrate with a little cake-swap! 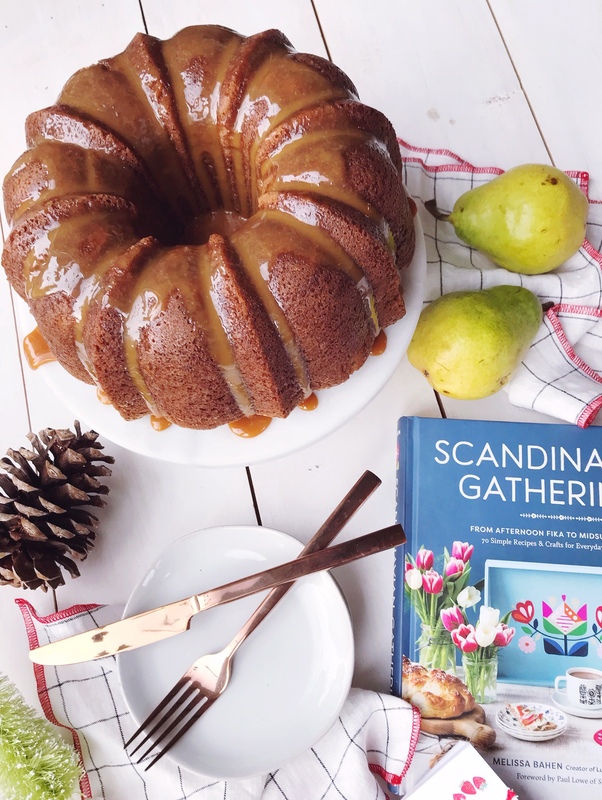 Today Melissa is sharing my favorite cake recipe from my cookbook over on her blog, and I’m getting my cake-consumption on over here with a Spiced Pear Bundt Cake (with homemade caramel sauce!!) 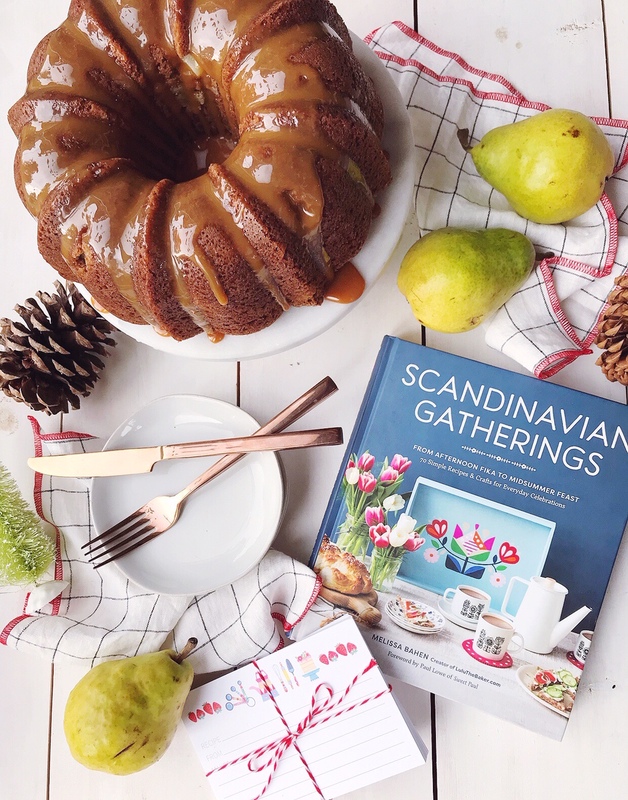 from Melissa’s beautiful book: Scandinavian Gatherings. 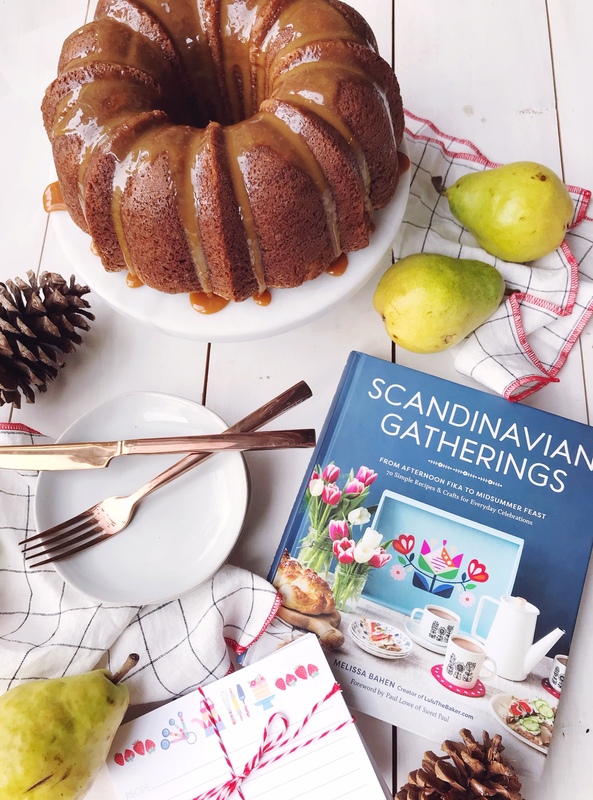 It’s hard to decide what is more lovely, this flavorful cake full of spices and bits of fruit, or her book which is packed with Scandinavian recipes, crafts, and traditions. I served this cake over the holiday weekend and it was hit — we ate it for breakfast, snacks, and dessert, and I know I’m going to be pulling it out again at Christmas. Get the full recipe below, and be sure to check out Scandinavian Gatherings! To make the cake, preheat the oven to 350°F. If using a dark bundt pan, decrease the temperature to 325°F. Generously butter and flour the interior of the bundt pan, shaking out any excess flour. In a large bowl or in the bowl of a stand mixer, combine the butter and both sugars. Beat on medium speed until fluffy, about 1 minute. Add the vanilla and eggs one at a time, beating on medium after each addition until smooth. In a medium bowl, combine the flour, baking powder, baking soda, salt, and all spices. With the mixer on low speed, add ⅓ of the flour mixture to the large mixing bowl, followed by half of the milk. Continue alternating flour and milk until all have been added. Scrape down the sides and bottom of the bowl with a rubber spatula, then beat the batter on high for 20-30 seconds. Pour half of the batter into the pan. Sprinkle half of the pears evenly over the top of the batter. Pour the rest of the batter into the pan, and cover with the remaining pears. Bake the cake for 65 minutes, until the cake begins to pull away from the edges of the pan, and a bamboo skewer inserted in the center of the cake comes out clean. Allow the cake to cool in the pan for 10 minutes, then gently invert it onto a cooling rack to cool completely. While the cake bakes and cools, make the caramel. Combine the sugar and water in a small, heavy-bottomed saucepan with tall sides. Cook the mixture over medium heat until the sugar dissolves, 4-5 minutes. Turn the heat up to high and cook until the mixture caramelizes and turns amber-colored, about 7 minutes. It should be the color of clover honey. Immediately remove the caramel from heat, and add the cream, whisking constantly. The mixture will sputter and splash, so wearing long sleeves and/or an oven mitt is a great idea. If the mixture seizes up, whisk it over medium heat just until it becomes smooth. Add the butter and vanilla, whisk until smooth, and allow to cool to room temperature. Serve the cake at room temperature. Drizzle slices with caramel and top with lightly sweetened whipped cream. *(c)2016 By Melissa Bahen All rights reserved. Recipe excerpted from Scandinavian Gatherings by permission of Sasquatch Books. Cozy Holiday Gifts with Garnet Hill. Gift Guide for the Bookworm. One Response to "Spiced Pear Bundt Cake with Caramel Sauce." This looks delicious! I love using pears around the holiday season – they strangely add a warm element to any recipe!